Larry Brown's idiosyncratic and powerful Southern novels have earned him widespread critical acclaim. Now, in an ambitious narrative structure reminiscent of Robert Altman's classic film "Nashville," this "true original" "(Chicago Tribune)" weaves together the stories of a sprawling cast of eccentric and lovable characters, each embarked on a quest for meaning, fulfillment, and love -- with poignant and uproarious results. Set in Memphis and north Mississippi, "The Rabbit Factory" follows the colliding lives of, among others, Arthur, an older, socially ill-at-ease man of considerable wealth married to the much younger Helen, whose desperate need for satisfaction sweeps her into the arms of other men; Eric, who has run away from home thinking his father doesn't want him and becomes Arthur's unlikely surrogate son; Domino, an ex-con now involved in the drug trade, who runs afoul of a twisted cop; and Anjalee, a big-hearted prostitute with her own set of troubles, who crashes into the lives of the others like a one-woman hurricane. Teeming with pitch-perfect creations that include quirky gangsters, colorful locals, seemingly straitlaced professors, and fast-and-loose police officers, Brown tells a spellbinding and often hilarious story about the botched choices and missed chances that separate people -- and the tenuous threads of love and coincidence that connect them. With all the subtlety and surprise of life itself, the story turns on a dime from comical to violent to moving. 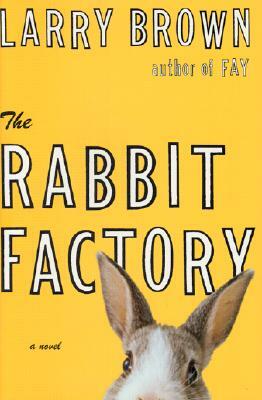 Masterful, profound, and full of spirit, "The Rabbit Factory" is literary entertainment of the highest order.